As the name suggests, load bars carry a loads on conveyors. Normally a carrier is attached at one point to a chain pendant, however the load bar is suspended from two points on the conveyor chain. So by using a load bar we have effectively spread the load out, distributing it over more chain bearings on the conveyor system. Typically a load bar is used when the product being carried is large and heavy or simply to maximize the life of your overhead conveyor system by distributing load weight evenly. 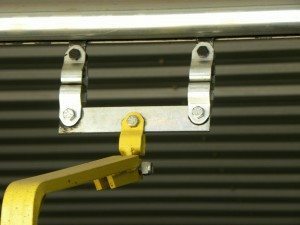 The load bar essentially doubles the capacity of the conveyor by doing this and if required it can even double again by using a 4 pendant load bar. For example if an overhead conveyor has a capacity of 50 lbs. per chain pendant, with a load bar you would be able to carry a load of 100 lbs safely, and even 200 lbs if you chose to use a 4 pendant load bar. Just remember you still want to make sure that your track is safely supported for the larger load. Load bars can also enhance the stability of the load. As loads come out of a curve they can exert a twisting force on the chain pendants. Using load bars ensures that this ‘twisting’ is resisted. There are many variations of load bars and they can even be arranged to carry multiple loads under each, so that there is great flexibility in the placement of the loads. All these factors just depend on your current or proposed system and your application needs.